In the space of 96 hours, two United States Supreme Court Justices addressed students and faculty at Miami Law. Justice Stevens, 94, challenged case law where guilty pleas of immigrants on non-immigration matters – often minor crimes – triggered mandatory removal from the U.S. This often happens without understanding the ramifications of deportation prior to a plea. Justice Stevens argued that “the proposition that exclusion of advice about collateral consequences from the Sixth Amendment’s scope” might well be a widely recognized rule of American law, but that it was inappropriate in this arena. It was wrong, he said, to consider deportation a mere collateral consequence. 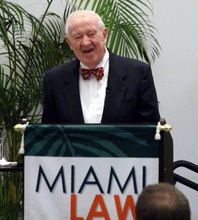 During a lively and engaging question and answer period, Justice Stevens advocated for greater adjudicatory discretion in assessing individual cases. Justice Stevens, once on the conservative wing of the Court, came to be considered a liberal voice. He retired from the Court in 2010, at the age of 90. The Symposium took a critical look at how our nation’s laws have been increasingly criminalized over the past 30 years, the negative consequences of this criminalization, and recent positive developments. It explored criminalization through a variety of subjects, including sentencing policy, immigration, homelessness, and race and social class. 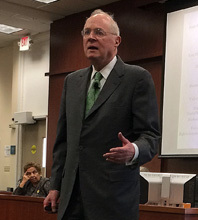 Justice Anthony Kennedy returned to Miami Law to deliver a Robert B. Cole Lecture, titled "Magna Carta: Relevant after 800 Years." Justice Kennedy worked his way back and forth across a remarkably long period of time, beginning with the Ten Commandments, through Athenian and Roman law, forward to the signing of the Magna Carta by King John of England in a field in 1215 and along to the present. “The principles that the English perfected 800 years ago – the struggle for freedom – has just begun,” Justice Kennedy said. Constitutions evolve, he said. Justice Kennedy said it is good to romanticize founding political documents. He concluded with a quote from John Locke about the duty to those with whom we disagree, to do so with respect and dignity. 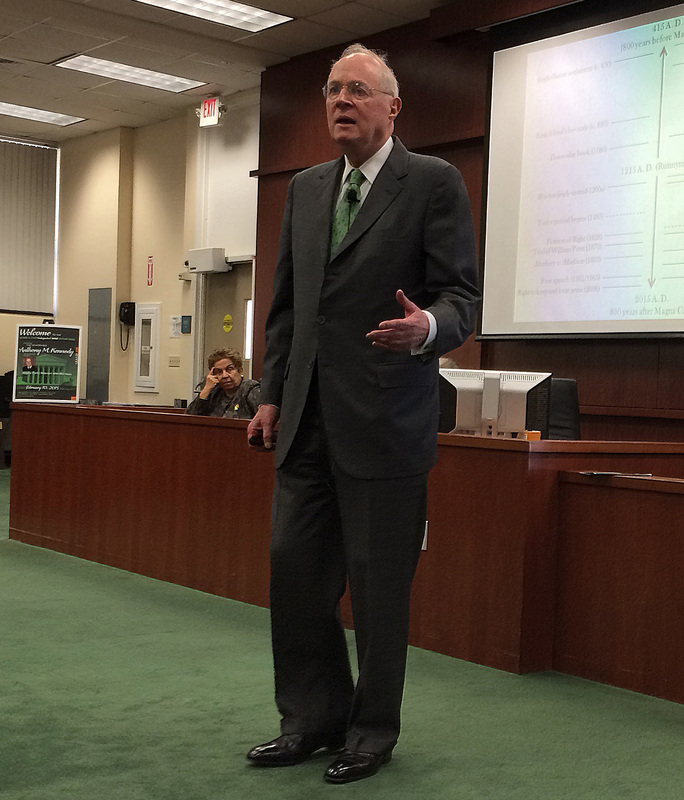 "Justice Kennedy has visited the Law School three times in the last few years," said Vice Dean Patrick Gudridge. "We are very lucky. He has an unusual gift he uses well in his public talks – taking ideas and events that we at first take for granted and therefore don't think too much about and then — as he makes us look at them over and over — making us see that there is often much that is surprising, important, complex, and ultimately often moving in what we had thought to be just commonplace. This is constitutional law in the style of Earl Warren and Ronald Reagan, we might think — a really remarkable synthesis." Justice Kennedy, 78, has served on the Supreme Court since his appointment by President Ronald Reagan in 1988. The Robert B. Cole Lecture was established in 1985 through the generosity of the former Miami law firm of Mershon, Sawyer, Johnston, Dunwody & Cole. The Lecture honors the late Robert B. Cole. Cole served for many years as the principal legal advisor to the University of Miami and served on the School of Law’s Visiting Committee. Attorney Richard P. Cole continues to sponsor the Lecture in memory of his father. The Cole Lecture provides a forum for faculty, students, and practicing attorneys to hear distinguished jurists and public figures discuss important legal and international matters. Previous speakers include United States Supreme Court Chief Justice Warren E. Burger, Chief Justice William Rehnquist, Justice John Paul Stevens, Justice William J. Brennan, Jr., Justice Harry A. Blackmun, Justice Antonin Scalia, Justice Sandra Day O’Connor, Justice Stephen G. Breyer, Judge Alex Kozinski, Chief Judge of the U.S. Court of Appeals for the Ninth Circuit and George J. Mitchell, former Majority Leader of the United States Senate. 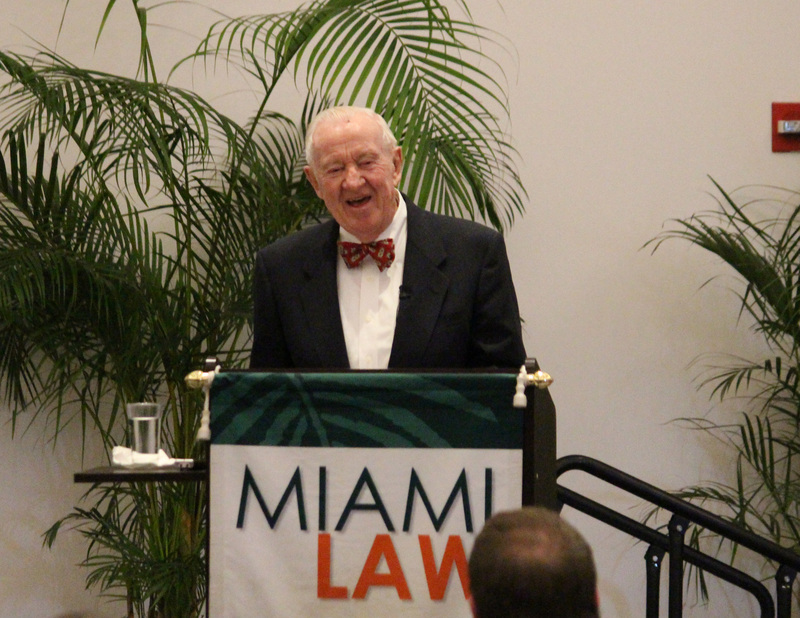 Watch video of Retired Justice John Paul Stevens deliver the keynote speech at the University of Miami Law Review Symposium.